When will the Democrats make the first step of the 12-step program (admitting!)? Recently I added my two cents to a Facebook discussion on the nature of the current political environment. 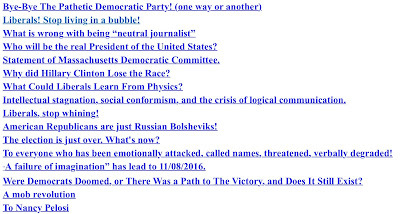 I also published a post “Peering through the fog of brainwashing”. (http://the3dforce.blogspot.com/2017/07/peering.html). Soon a Facebook comment brought a reaction to my post. I always welcome critical comments; they energize my thinking. I posted a reply “Keep being an ostrich with the head in the sand. Good luck in 2018” and a comment: “Hey, we are The Democrats, we KNOW how the American political system works. What? Contradiction? What contradiction? Why did we lose elections? Why don't we control any of the three branches of the government? Well, we KNOW how the American political system works. I guess we just don't use it. I guess we just don't do anything about it” and waited. I knew I would get a further response. And it came: “It's almost as if the extreme left spent the entire election sabotaging them over nonsense...”. While waiting for the response, I have prepared the new post – this one. Quote: “It's almost as if the extreme left spent the entire election sabotaging them over nonsense...”. That line is written by someone who is ignorant in logic, and arrogant in the nature. This type of a “song” is old as the Nature. If only that would be so easy to do. Human nature is not so simple; otherwise no one would need the 12-step program (https://en.wikipedia.org/wiki/Twelve-step_program). What is the FIRST step? - Admitting! The Democrats still cannot make even this first step! They are still in the state of denial. 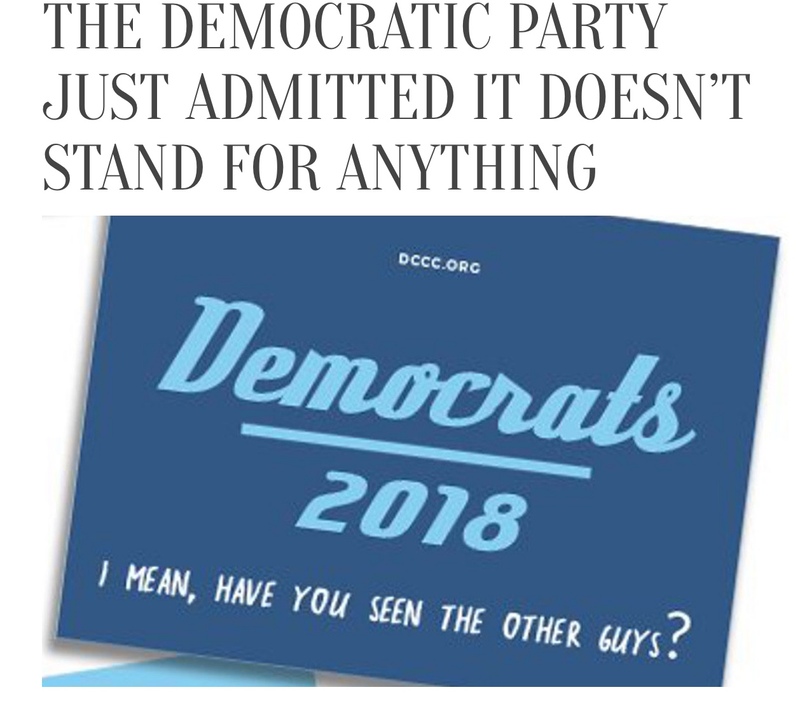 The Democrats have not offered a single truly new idea. Ideas like a universal healthcare, $15 per hour minimum, etc., etc., have been around for a long time. However, they have not attracted people in numbers enough to win the elections. People who supported Bernie Sanders supported him because of the same reasons people who supported Trump supported him – personality, charisma, being an outsider, being bold, saying what comes to mind, being just unusual. Still, expecting Bernie Sanders winning in 2020 is a delusion. 2. More people have become politically energized. 1. Saying: “Hillary Clinton won the popular vote” is NO different from saying: “Our team lost, but it made more ball throws to a ring”; “Our team lost, but it made more kicks to the goalkeeper”; “Our team lost, but it made more throws of a puck toward the net”; etc. It only demonstrates the fact there was indeed an opportunity for the Democrats to win, but they were simply incapable to use it. What to expect when that opportunity is decreased (the Democrats do not have any more neither the White House, nor the congress)? 2. Regarding having more energy at hand, I would like to offer an old joke (taken from this post http://the3dforce.blogspot.com/2017/04/progressive.html). I guess, it is clear that I see the Democrats - as that guy – trying just “shake the three harder”, in hope “the banana would fall” (the elections would be won). In politics, like in physics, the amount of force or energy does not matter on their own. What is much more important is how that energy is being used, directed, utilized, organized (a short video about what liberals could learn from physics: https://www.youtube.com/watch?v=OwzKlFpIt_E). I’ve got much more on the matter at http://www.gomars.xyz/op.html. Appendix (added a day later). "Now, I am often asked—I’m often asked by the media and others: How did it come about that Donald Trump, the most unpopular presidential candidate in the modern history of our country, won the election? 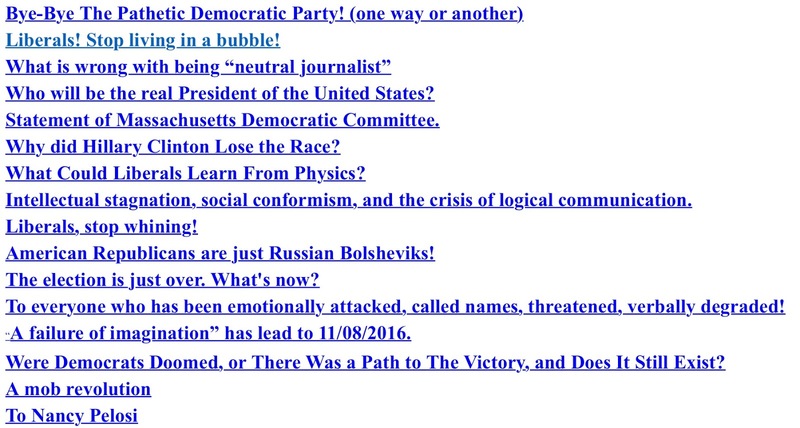 And my answer is—and my answer is that Trump didn’t win the election; the Democratic Party lost the election. 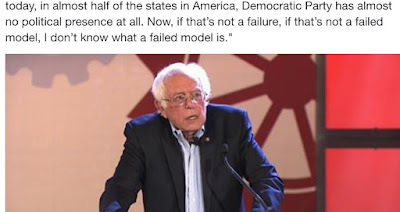 Let us—let us be very, very clear: The current model—the current model and the current strategy of the Democratic Party is an absolute failure. This is not—this is not my opinion. This is the facts. You know, we focus a lot on the presidential election, but we also have to understand that Democrats have lost the U.S. House, the U.S. Senate. Republicans now control almost two-thirds of the governors’ chairs throughout the country. And over the last nine years, Democrats have lost almost 1,000 legislative seats in states all across this country. Today—today, in almost half of the states in America, Democratic Party has almost no political presence at all. 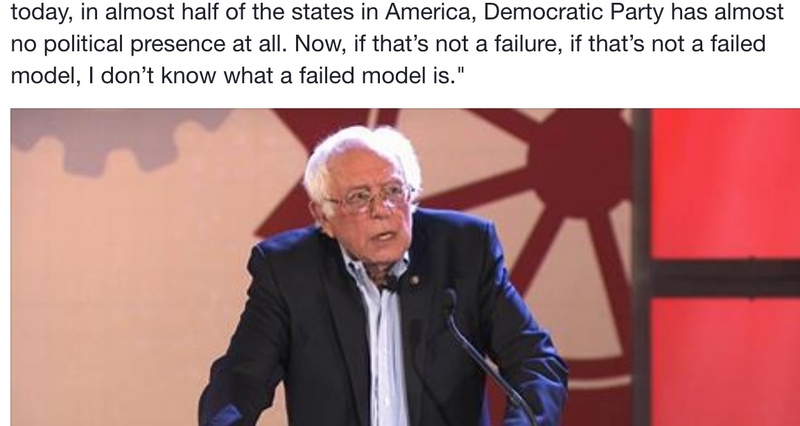 Now, if that’s not a failure, if that’s not a failed model, I don’t know what a failed model is." My question is – if the model of a LARGE social organization is a failed model, how much time would be needed to make a transition to a working model? (a) What do we need to do to bring the Democrats in the Congress to majority? (b) What do we need to do to bring the Republicans in the Congress to minority? These are two different questions, and they have two very different answers! The first goal requires long and painful reforms inside the Democratic party (simply because social inertia is huge; inside fighting is vigorous and makes all factions weaker; but none of the factions will give up the fight). The second goal requires formation of a third national party – and it needs to be done NOW! Out of all my posts on this blog, these four are the most connected to the long term political future of the Country. The Dawn of The Era of Dictatorships; Explained by The Systems Theory. Peering through the fog of brainwashing. The fog machine is working and is very effective. People are debating what health care plan is god, bad, or ugly. No one seems to get to the roots. And the roots are very simple. 1. The globalization had resulted in that many white Americans lost their highly paid jobs - and NO one (neither Republicans nor Democrats) know what to do about it, so they do nothing, but blaming each other. 2. For the last decades (at least) the American demographic has been drastically changing in such a way that non-white Americans soon should become the majority (http://www.epi.org/publication/the-changing-demographics-of-americas-working-class/). Everything so-called “conservatives” do is to prevent the white soon-to-be-minority from losing the political power. Gerrymandering, voter suppression, unreasonably strict anti-drugs laws was just the beginning. Conservatives have been quietly building up a brainwashing media machine. If you think FOX News, or Breitbart – you are wrong. Those guys are not quiet. Think Sinclair (https://en.wikipedia.org/wiki/List_of_stations_owned_or_operated_by_Sinclair_Broadcast_Group); check the latest John Oliver’s piece on it (https://www.youtube.com/watch?v=GvtNyOzGogc). BTW: what do Democrats do about it? Nothing. They do not have any vision. Thy just happy that more people get upset with Trump and express their anger. But what do Democrats do now what we could called NEW and SIGNIFICANT? Nothing. They just keep doing the same thing again and again and waiting for new result to happen, but just with more energy (lots of posts on the matter at http://the3dforce.blogspot.com/; for example http://the3dforce.blogspot.com/2017/04/why.html; or http://the3dforce.blogspot.com/2017/03/warren.html). GOP’s healthcare plan is new tool to keep the status quo. It is designed to hit the poorest. Anyone who says: “but it also hits Trump’s base” does not see far enough. It may seem like the plan hits the Trump’s base, but when it comes to its realization, some adjustments will be done, but not for everyone. In his recent interview to NPR Dr. Rod Hochman said: “America as a country is older and poorer.” (http://www.npr.org/2017/06/28/534681846/hospital-official-waits-to-see-when-senate-votes-on-gop-health-bill). - a strong book on human behavior). Unfortunately, that fear resonates with many, and ignored by even more. A couple of weeks after this post was published, the Republicans came up with the new version of the health care bill. In that bill they proposed to treat differently rural folks and urban folks. This is exactly the type of adjustment I originally mentioned! When they say "rural" they mean "white Americans". "Urban" means either rich people who will not be affected by any version of the bill; and poor minorities who will be kicked out of the health care if the bill will be accepted. There are however two commonalities in how Republicans treat all the poor, white and non-white. 1. The Republicans do not want people to think. And the best way to keep people from thinking is to make them work so hard, they have no energy left for anything else. When one has to work 60 hours a week, juggling two jobs to only make it a paycheck to a paycheck, one has no ability to think about social and economical issues. One just comes home, drinks some bear, and falls into a bed. 2. The Republicans do not want people to know. That is why they fight anything which may help improving public schools, especially in urban areas.